The UWI Open Campus, Anguilla. Friday, August 17, 2018 —The University of the West Indies (UWI) Open Campus is partnering with the Government of the Turks and Caicos Islands (TCI) to re-establish a physical presence in the territory. The re-launch of The UWI Open Campus Turks and Caicos Site is an initiative of the TCI Ministry of Education and comes in the wake of an increasing number of TCI residents in The UWI’s online programmes. The partnership will see the re-opening of The UWI Open Campus TCI in Providenciales following the closure of the Site in Grand Turk some years ago. The re-introduction of the Site will allow for ease of access to the University’s online degree programmes, as well as its Continuing and Professional Education programmes. It will also serve to strengthen the University’s longstanding bonds with the Turks and Caicos Islands Community College. The initiative is part of the Government’s plan to ensure that Turks and Caicos Islanders who may be constrained by economic or social responsibilities can access tertiary education through online/face to face modalities within the borders of the country. The Government strongly believes that the partnership with The UWI via the re-establishment of an Open Campus Site in the Turks and Caicos Islands will achieve this goal. According to the Honourable Minister of Education, Youth, Culture and Library Services, Mrs Karen Malcolm, “While education has inherent value beyond the economic function, it is essential for an individual to have a productive and meaningful career. This depends on the opportunities created in the economy. The more vibrant and sophisticated the economy, the more individuals can fulfil their aspirations, and the more governments will have the resources to invest further in education.” “This partnership between the Turks and Caicos Islands Government and The UWI Open Campus will help many realize their dreams and permit every native of the Turks and Caicos Islands an opportunity to obtain a degree at the tertiary level. Given that most people would love the opportunity to obtain their degree but they do not have the time; they now have access to online studies in the comfort of their own home,” the Minister said. 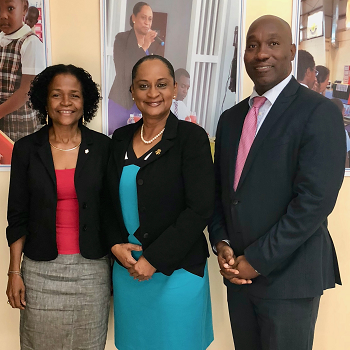 The ongoing discussions have included a number of virtual meetings with the Honourable Minister and other Education officials, as well as a recent site inspection visit by Manager for The UWI Open Campus British Overseas Territories, Dr. Phyllis Fleming-Banks.